Google's AlphaGo to take on Lee Sedol for $1M prize. 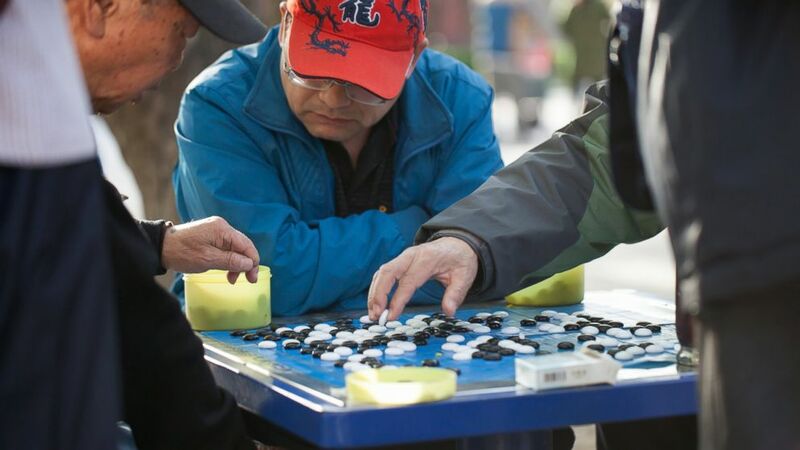 camera (Xiao Lu Chu/Getty Images) People play the game of Go in Ditan Park, April 4, 2014 in Beijing. Google's artificial intelligence system is set to take on the world champion of "Go" -- a game with trillions of possible moves -- in a live showdown that will be streamed on YouTube. The search engine giant's AlphaGo computer program already swept the European champion of Go, a complex game with trillions of possible moves, in a five-game series, according Demis Hassabis, head of Google's machine learning, who announced the feat last month in a blog post that coincided with an article in the journal Nature. Hassabis revealed the plan for the YouTube Go championship, which will pit Google's computer against champion Lee Sedol in a best-of-five tournament taking place March 9 through 15 in South Korea. Thrilled to officially announce the 5-game challenge match between #AlphaGo and Lee Sedol in Seoul from March 9th-15th for a $1M prize! While computers can now compete at the grand master level in chess, teaching a machine to win at Go has presented a unique challenge since the game has trillions of possible moves. It's estimated there are 10 to the power of 700 ways a game of Go could be played. By comparison, chess has around 10 to the power of 60 possibilities, according to researchers. Go, a board game that was played in ancient China, pits two players against each other. The players take turns placing black or white stones on a grid, with the object of dominating the board by surrounding the other player's pieces. The stones can't be moved unless they are surrounded or are captured by the other player. Google said last month its program won 99.8 percent of games against other programs designed to play Go -- giving it a nearly perfect record. The team was able to perfect AlphaGo by setting up two neural networks. One network would be able to predict the next move while the other would predict the outcome, Hassabis said. The program got smarter by learning about games played by human experts while also playing thousands of games between its neural networks, allowing it to better master Go. The development shows how stunningly smart computers are becoming but it also has real-world applications, Hassabis said. "While games are the perfect platform for developing and testing AI algorithms quickly and efficiently, ultimately we want to apply these techniques to important real-world problems. Because the methods we’ve used are general-purpose, our hope is that one day they could be extended to help us address some of society’s toughest and most pressing problems, from climate modelling to complex disease analysis," he wrote in his blog post. Facebook CEO Mark Zuckerberg also announced last month his team is making strides with an AI system he said his team is "getting close" to creating a system that can master Go.